Welcome to Goblets.com. Goblets come in a limitless variety to suit anyone's particular taste. From pewter goblets to crystal goblets, the style and look of a goblet can vary greatly. A Goblet, also called a chalice, is a type of cup usually used for the consumption of wines or other fine drinks. However, there are many kinds of goblets that are used for more than just wine. Goblets have no handles and no side ordainments like mugs. They consist of a drinking pocket, or a cup that sits on top of a stem connected to a base. Much like a wine glass, though they are normally far less delicate in their construction. 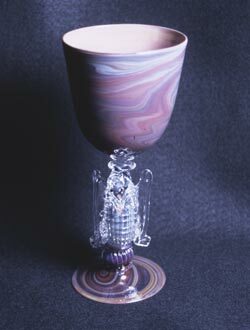 Goblets come from Christian and Jewish traditions, chiefly the tradition of communion being taken from a highly ornamented goblet, as seen in the Catholic religion. The acclaimed "Holy Grail," the cup that Christ was said to have drunk from, is normally depicted as a highly decorated goblet, usually gold, with assorted jewels adorning its sides and base. It is also used in a variety of other religions as an iconic symbol, though none to the wide acclamation of the Christian tradition. Goblets are used for many purposes primarily stepped in drinking. Though there are some goblets made for the purpose of decoration rather than practical use. These Goblets tend to be less stable in their construction and more delicate to the touch. Listed below are the different types of Goblets and their traditional uses. 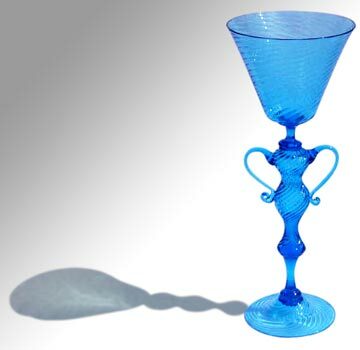 Water Goblets - These goblets are, as the name suggests, used for the consumption of water. They are traditionally made out of a hardened glass, normally thicker than the average cup, though they have been known to be made from tin or other cheaper metals. These goblets are among the least of the decorated goblets. They are usually bland and employ very little to no decorations. The only decoration these goblets might have would be a unique pattern in the sides created when the glass was formed. Stone Goblets - These goblets are rarer than traditional water goblets because stone is a difficult material to work with, thus making it more difficult to craft a goblet from. These goblets have no particular beverage that is exclusively consumed from it, as they are primarily put on display rather than served from. These goblets can be made of marble, granite, or other similar stones of like consistency. Crystal Goblets - These goblets are normally more delicate and used for the consumption of fine wines or other delicately tasting liqueurs. They are cast of a thin crystal to emphasize their use for finer beverages rather than bland water or other such things. They are often confused with ornate wine glasses as their construction is similar to those. In fact, the two are technically one in the same because they are both used for wine. Silver Goblets - These goblets are often very ornate in appearance and are often used for only display rather than practical use. Though when they are used, they are used for either the consumption of wine or water. The silver goblet, though more expensive and decorative, is not often practically used, so a standard beverage has never truly been assigned to it. Gold Goblets - These goblets are among the most decorative of all goblet classes. They are forged from gold, sometimes solid and sometimes coated, depending on the price, obviously. In some cases they are also adorned with jewels and other decoration to make them appear fancier. These Goblets, like silver goblets, are seldom used for practical purposes, though when they are, it is more common to see finer drinks being consumed from them. These goblets are very popular in the Catholic sect for taking communion because they are meant to be representations of the "Holy Grail" the acclaimed chalice that Christ was said to have drank from. Goblets are often used in ceremonial settings, though they can be used in more casual settings such as parties or social gatherings. The most common use of them is in religious ceremony as stated before. In the Catholic sect, the priest administers the church congregation a sip of wine from a highly decorated gold or silver goblet. This is meant to mirror the Last Supper of Christ. Goblets are also used in ceremonies such as weddings when the newlywed bride and groom will drink a beverage, normally wine, from the goblet to signify their new life together and their sharing of all things. Goblets are also used on some occasions during the wedding receptions where the bride and groom will raise often one of a kind or exclusive goblets during wedding toasts and speeches. A small, easily broken goblet is also used in Jewish weddings where the groom will stomp on the goblet after the bride and groom share a drink from it. This is meant to symbolize the destruction of the temple and the breaking of the Jewish people's hearts when the great temple was destroyed. Goblets can also be used in party and other social gathering settings to simply enjoy fine wines and other beverages from. In the fourth installment of J.K. Rowling's "Harry Potter" series, the center of the story revolved around a competition where a magical goblet picks three students to be champions in a great tournament. The goblet was known as the "Goblet of Fire" because instead of liquid being within the goblet, there were large licks of flame emitting from the cup portion. In the Film release of "Harry Potter and the Goblet of Fire," the goblet was golden and highly decorated, granting popularity and fame to this oft-forgotten class of drinking apparatus. The movie and the book of "Harry Potter and the Goblet of Fire" brought wide acclaim and a resurgence of appreciation to the Goblet because both the film and the novel displayed the famed Goblet of Fire in such a glamorous and ornate way. In many paraphernalia stores and dealers, replicas are sold of the Goblet of Fire that is identical, though smaller, as the one in the film version. This is allowed to the clever reconstruction of this age-old drinking cup.